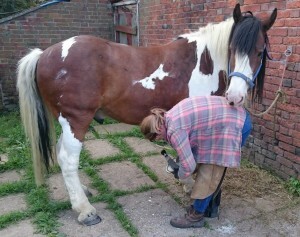 Horses sometimes have issues with hoof care. Either they don’t want to or they can’t stand on three legs. After you have eliminated the can’t by checking for pain issues with the relevant specialists, as a recognised professional with Horse Charming I can help train them to both want to and to actively enjoy participating in the process. Some horses find it difficult to stand on three legs, due to pain, fear or lack of training. Reluctance is often about fear. That could be fear of pain, or fear of being vulnerable if they do not have control over all four legs. Some horses are also fearful of leaving their friends or of things in the environment in which they might be expected to stand for hoof care. Others might be wary of the trimmer’s equipment and tools. When it comes to standing on three legs, and especially for handling front feet, sometimes we need to teach the horse how to position their feet so that they can balance, because they don’t know how. Using systematic desensitisation, counter conditioning and positive reinforcement techniques it is possible to quickly change the mind of a horse from “I don’t want to” to “Yes please!”. Systematic desensitisation involves gradually introducing the horse to either new objects or situations, keeping the horse comfortable and confident (below the reactivity threshold) with each introduction. This involves lots of small repetitions, each time introducing the horse to the different aspects of any object or experience at low strength (e.g. sight, sound, smell, feel) or slowly increasing the amount of time the horse can tolerate a situation. This is useful particularly when a horse suffers from separation anxiety or has had bad experiences with hoof care in the past and has become sensitized to either the environment or the equipment or to the approach of an unknown person. This pony was scared of strangers when I met him. After a few days of systematic desensitisation and counter-conditioning, he was happy to hang out with me and didn’t even mind wearing my hat. The purpose of counter conditioning is the change the associations the horse has with particular things and events, and involves pairing something very enjoyable with a less pleasant stimulus or situation, to change the expectations the horse has of a previously mildly unpleasant “thing”.That something enjoyable might be some very desirable food, such as a lick, or it might be scratches. When done together with systematic desensitisation, this is very useful with babies, who are worried about standing on three legs because their balance isn’t very good yet. The nice thing might be presented when the horse is first introduced to a rasp or hoof stand, or when the trimmer arrives. Positive reinforcement involves giving a horse something they like as a consequence of them performing a desired behavior. The moment the horse performs a behaviour we want more of is usually marked by a short sharp audible signal and then some food or a scratch is given immediately afterwards. 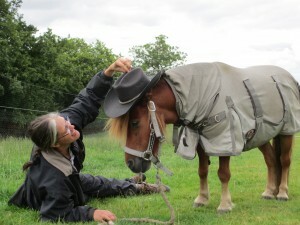 Horses soon learn to repeat the behaviour that was marked and positively reinforced. For example we can mark the moment the horse first begins to lift a foot off the floor and then, through a process called shaping, we can teach the horse to lift their foot higher, and hold it up for longer. The horse learns to repeat the behavior that is marked by the signal and followed by a food reinforcer or lip curling scratch. Sometimes it can be useful to use a clicker (such as those used in dog training) to make that marker signal sound– hence why this form of training is sometimes called clicker training. Many zoos use positive reinforcement training with their animals to allow the keepers to safely carry out health checks, trim feet and even administer injections without using any restraint through the bars of their enclosure with otherwise dangerous species.